This set is adorable and love it as well. 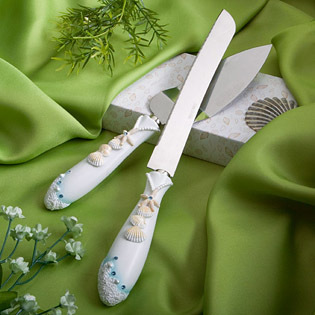 So thankful to have a beach wedding theme when the day arrives to use these to cut our wedding cake. Love the seashells and dolphins which makes a beautiful theme. The shells on this set are so precious. Will buy more items for the big day soon! As beautiful as shown on the webpage. Very satisfied!! Bought these along with the toasting glasses for our wedding! They are beautiful! They were well packaged. They arrived quicker than I expected and are really pretty! Great purchase, especially for the price! 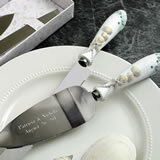 I got these to match my guest book, pen and my wedding theme. Very pleasing to the eye and beautiful. Nicely made. I'm really glad my grandparents got me the whole set for my wedding. Got this for my sister's Birthday Party and she loved it! I also found cake topper to match. Very nice set. Matched our theme perfectly!